A century after the first American Revolution gained independence from the English monarchy, a second revolution erupted: this one to end slavery. The Civil War coincided with the emergence of wage labor as a social class, and brought with it a rise in cotton prices, because the Confederacy’s secession led to the intended breakdown of North-South trade relations. The resulting crisis for northern textile producers brought the economy to its knees in a depression, where jobs were hard to come by. In a small neighborhood in lower Manhattan, known as Five Points, an ancillary revolution was under way, even as the economic crisis played havoc with a layer of new immigrant workers and black freed men and women. These new arrivals lived, worked, and intermingled there. The musical, “Paradise Square,” recreates Five Points and its denizens. It is set in an imagined bar run by Nelly Freeman, where Irish and African-American newcomers congregate and court romance. In its midst is a stop on the Underground Railroad, and outside its doors, a dockworkers’ strike is gaining steam, just as President Abraham Lincoln is about to issue a new draft call. It’s where, under a pseudonym, a down-at-the-heels songwriter named Stephen Foster, hires on to play piano. Scheming to collect material to turn into new songs meant to compensate for earlier failures, Foster eavesdrops on exchanges between the interracial couples. The show is a smash hit in Berkeley, and as of this writing, has been extended twice. In the same spirit that the musical “Hamilton” has been rewarded for tipping its hat to audience hunger for verisimilitude, Paradise Square dispenses with pandering, to instead uncover a hidden history revealing the bonhomie and fellowship among Irish and black bar patrons, but it also profiles the acute divisions imposed by depression and war. As in other cities, each new wave of arrivals joins a reserve army of the unemployed, which the bosses welcome as leverage against those striking for higher wages and improved working conditions. Even Blacks who had learned trades while enslaved, are excluded from the guilds and labor organizations that called or support the strike. Blacks are also excluded from Lincoln’s new draft call, where the wealthy can buy their way out by paying $300. The Irish feel victimized, and begin by expressing their rage in the northernmost wealthy neighborhoods, but then the riots are prodded into taking a racist turn south in the direction of Five Points. What start out as draft riots turn into race riots, with Caucasians attacking African-Americans, who are in some instances lynched by those with whom they had raised a glass before the divisive draft call came down. Among them are blacks used against the strike as scabs, the only work open to them. Here we have a crucible in which those who inhabit the interracial relationships impaired by these divisions are subject to manipulation by the resulting pecking order, but who will ultimately benefit from the end to slavery that the Civil War brings. Paradise Square is based on real events, replete with revelations about race relations a century and a half ago, heretofore unknown to even the best-educated of audiences. Allen Moyer’s set divides Five Points into at least five more vertical and horizontal points, and I wondered how choreographer Bill T. Jones, whose storied oeuvre rests on pure movement, collaborated with director Moisés Kaufman, to mount a period piece on a bridgework maze proscenium stage. I was able to speak with Jones by phone, and sit down with dancers Karen Burthwright and Garrett Coleman, to uncover the process of creating the show’s dance aspect. How did you become involved in the project, and what did the dance-related challenges look like at first blush. 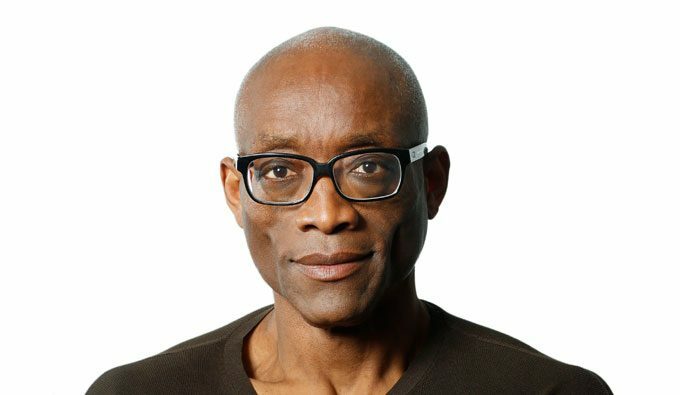 Bill T. Jones: I came to the project because I was invited by the producer. I usually work in the not for profit realm, but this is a project that brings in continuing revenue, so I have access to more and more varied resources. I was interested in the story, coming as it does from Larry Kirwan, and Craig Lucas, not sure I’d be asked to do more than create a few dance numbers. Where did I get the sense I’d be collaborating with the director? During the first two years, I found that I was flying to Toronto to sit around a table to hammer out the story’s concept and work on the book, learn the areas of concern, and what the Kirwan story would have to grow into for contemporary audiences, a story about the Irish and Blacks during the Civil war. These circumstances were under constant reconsideration, dominated by the unusual nature of the club, a dance hall, featuring what we interpreted as pre-Vaudevillian acts. What would be the status of an integrated cast? How would we approach the implied prospect of blackface and the Stephen Foster songbook? What songs would lend themselves to the story, updated for consumption by contemporary audiences? The first couple of sessions were spent just talking about the book, then we did auditions and I did my best to support an ever-changing book. Karen Burthwright: For me, the challenge was to audition in the Irish dancing style, where I was put through the paces using new muscles, with notes on all the minutiae. It turned out to be the same cardio with the same focus, just in a completely different style. I had lived in Chicago for a number of years, a place where knowing Irish dance and sharing it, was important to my Irish friends; it was their craft. It felt wonderful to acquire it as a means to tell a story about both Irish immigrants and African-American freedmen and women. Garrett Coleman: It was a unique opportunity to help craft choreography to imagine something that hasn’t been documented. There is no notation and no video of this important historical material. What the past may have held came into process because of the last ten years that I spent with Hammerstep [dance company,] where the initial impetus was to explore how seemingly distinct forms could come together. At the same time, we were honoring what was brought under Bill T’s guidance and the huge cast he assembled to embody that experiment. We started with a new Eight Hand Ceili traditional figure dance, and then learned the African Ring Shout and smashed the two together, deconstructing the forms in order to respect their authenticity. That they are both rooted in their cultures’ rhythms is the common denominator. What in the dance vocabulary did you draw on to imbue such gravitas on unique musical theater characters? BTJ: I thought that the way the show was conceived, we would be writing a play that would have musical numbers, supplemented by dancers. I tried to make scenes where principals dance by having everything relating to the main characters folded into narrative to speak or sing. In the young William Henry Lane dramatic role, he was a dancer; Owen Duignan was written and modeled as a historic composite of performing figures between the 1840s and 1870s that were found. GC: We were committed to remaining true to what’s traditional, in spite of being aware that if we were to make a mistake, the audience wouldn’t have seen it. We didn’t want to lean on that kind of free pass. You can genuinely allow yourself freedom to improvise if you have checked with authorities to assure that you are matching the style. What was it like to be or to work with a choreographer whose oeuvre mostly consists of pure movement works, as compared to character or jazz dance? BTJ: I don’t come from a musical theater background. I wasn’t looking for choreography from that tradition, but asked myself what feature of the moving body becomes the text in a discussion with the audience on that night, in terms of that history and tradition, which could be brought through pure movement, as opposed to linear storytelling. In the last month, Moisés Kaufman, the director, posed the dilemma as post-modern restructuring versus historical storytelling. By dropping in abstract pure movement I found you could say many things about atmosphere and characters without the work being character or story driven. Theoretically, unless an audience knows exactly what is going on, it will pull away, but that language can be larded through the story telling. There are many stories being told for the audience to keep up with in this show. In my work, there are several events taking place onstage, but then I relate to a stage as if it were a gallery, where strong forms in the manner of sculpture, for example, suggest ideas, but are present as their own thing; you as the observer, are tasked with making the connections. Traditionally, the musical theater audience represents a much more conservative world than the contemporary dance audience. I don’t want to speculate, good or bad about this guy Foster, or whether Nelly is a victim or a hero, or neither. This is a story form that arrives more like a TV miniseries than a true libretto. It was a struggle to become a member of a collaborative team, where there is room for only one final decision maker, the director, but it was an important struggle. Ultimately, the choreographer is there to serve book. I don’t go to many Broadway shows because they’re too expensive, but it seems people are trying to capture the panorama of storytelling in them nowadays. So you have to consider the economy of these encounters: Each of these characters, Nelly, Foster, the Irish boy, the Black dancer, and the secondary characters, has a story, and an audience can only take in so much information in one sitting. GC: You could say that Bill T substitutes “Feel don’t tell” for the cinema maxim, “Show don’t tell,” all in the interests of conveying a deeper, truthful story that couldn’t have been told in more literal movement or words. His gift has made the production cohesive with the successful interweaving of vastly different stories, feeling them via the dance form. GC: Because of his background, having been the eyes scrutinizing “Spring Awakening,” if it looks too orderly, he will ask those driving to get from A to B by taking the scenic route instead of the express lane. Bill T embraces rhythm as storytelling so that the texture of a story can be felt on a deeper, more visceral level. KB: This sensibility on his part produces a show that is especially well-constructed for the hearing impaired, or those with other sensory limitations. Audiences should not expect an average show, using traditional formulas. This is the one that makes the art accessible to all, regardless of class and race, or other factors that too often go by the boards. Please describe the process of interpolating two different dance styles with the director’s staging on a tight set, on a relatively small proscenium stage, where the choreography requirements are complex. BTJ: It started out with “Could you make a number here?” I was given carte blanche. We’re speaking of a community where Irish and Blacks were socializing in a time before Irish made it to white. The Irish were often ranked lower than Blacks. So there is ancient step dancing, African polyrhythms, stories told through gesture. I was given [Foster’s] “Oh Susanna” two years ago, in a studio in Toronto. How do these elements meet each other and combine? We’re doing one thing stage right, and then something else in another Petri dish, stage left. Jason [Oremus] and Garrett created a vision that might be a group of Irish dancers. We examined line dancing, like the Virginia Reel, and Eights Hands, with two bars done in Irish then the Black Buck and Wing inserted. Everyone had to learn everything as well as they could. I loved it; it was a revelation, particularly the Irish dancing plus funk, for me metaphorical for what I think Five Points was. I’m a choreographer who starts with the challenge and thrill of the naked studio. Dance will give it its architecture. Realizing how important the set will be, I’m faced with negotiating what I have to cut to do storytelling around a dance number. It paid off to have a theatricalizing process where you are keeping what you need for the story, as you work together. KB: You are aware of that space limitation of course, but I didn’t find it a huge problem. At no time is the full ensemble inhabiting the same space at the same time in Five Points. Parameters are always clearly defined by the orchestration and choreography. GC: Actually, we didn’t have a full set in rehearsal in Toronto, where we were workshopping the show in a big open warehouse-type studio. I find that I like the tight stage much better: It creates the place and feel of a bar hemmed in by tenements. KB: For me, because of their weight, the costumes were more of a burden than the set. To be truly authentic, there have to be the layers that women wore in those times, and moving in them, among such a large cast, can be daunting! How do you square the treatment of Stephen Foster in this project with the cultural appropriation debates at large in the arts world today? GC: Hammerstep worked with Zulu Nation break dancers and others who knew the flamenco scene. It became a melting pot of African stepping, hip hop and Irish, under guidance of others. With this kind of curating, it’s a blend of authentic cultures rather than what’s glibly referred to as “cultural appropriation.” You are charged with crafting a dance kaleidoscope, and bringing the art form into the 21st century by going back into time to examine and learn what went before. Do you think the enthusiastic audience response to Paradise Square sends a message to presenters and producers that audiences for musicals want something of historical value to take away? BTJ: In the dance world we find it exciting when there’s a tradeoff: Who is the audience in a commercial venture? How do you assure that great integrity prevails in spite of that, that the work is attractive to the largest, broadest, yet most diverse number? GC: We are of a generation that saw the dawn of electronic technologies, VR [Virtual Reality], AR [Alternative Reality}, Immersive Theater, and we want a deeper-level experience than the proscenium stage can provide. Without being rooted in the social climate where we get behind the story, a show won’t do as well. I see a shift in the tide, where up to this point, Disney has dominated and run Broadway. KB: What appeals to me most is that the audience can, for once, discover the truth in the “he said, she said” story genre. Maybe you will take your teenager to see this, go home and suggest that they write an essay on what they saw that was new to them about the past: two cultures you have always understood to be completely separate that quite naturally and organically come together, with all of their contradictions, on this piece of real estate we thought we knew and identified as Chinatown. You hear music by . . . who? Stephen Foster, and it is breathtaking! There is nostalgia, but it isn’t empty and sentimental: it connects with what resonates for the human race. I love doing shows where the onstage demographic matches that of the audience, it leads to intellectual discussion, or interrogation that might ask a question like: What if Lincoln’s draft hadn’t happened? GB: It takes courage to tell a story that’s a game changer in the approach to race and nationality, that start with class. This is America and its actual history. Kirwan wasn’t interested in sensationalizing the story. He looked at the photo of an African man and an Irish woman, and saw it as a couple in love in the 1800s. He saw that what was missing was their story, and he set out to tell it. We must remember that class rule requires racism. The starting point is class, where race is fundamental. What does the Paradise Square experience awaken in you about a wish list for future work? KB: I want to be exhausted, physically and intellectually. I don’t want to be told, “Oh, you look pretty.” I want my ancestors to be proud; I want to imagine Canadian and West Indian ancestors saying, “Congratulations and thank you.” For me, in this show, the music is the thirty-third cast member, and so I offer thanks to Stephen Foster for his most unbelievable, but beautiful music. In most shows, you don’t know the score in advance. It was such an advantage spiritually, to be familiar with this music, scored by such gifted individuals. GC: Deep research was involved in creating the music and it draws upon a number of influences, and it is striking how well it taps into the universal language of rhythm, such that you can’t tell where one influence begins and another ends. The energy it produces is uplifting. KB: It sounds like a film score. KB: Yes, the hope is to reclaim one’s genuine heritage, instead of the one imposed by the victors who get to write history solely according to the perspective of their class.